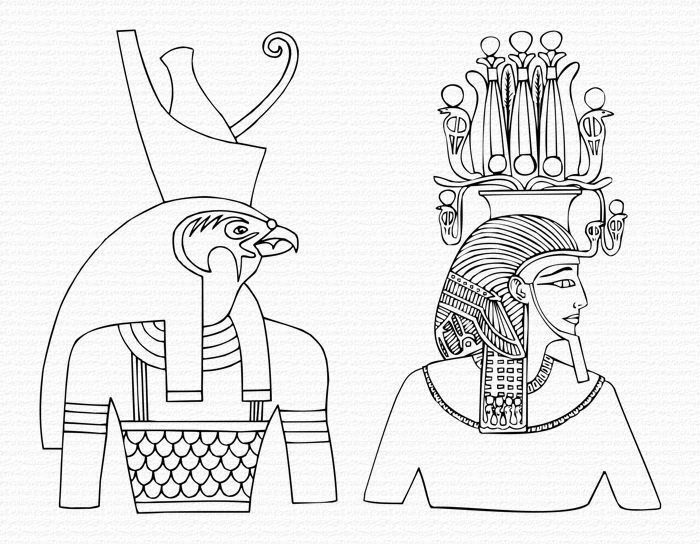 The Ancient Egyptians had many gods who are represented in human form with the head of a bird or a beast. They generally take on the natural qualites of that creature in mythical stories that explore the universal questions about life, death and the afterlife. 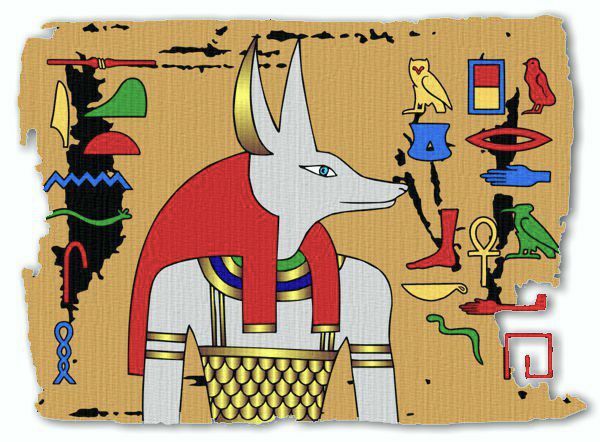 Anubis was depicted as a jackal. Anubis was the Egyptian god of the underworld who guided the spirits of the dead into the afterlife. It was his job to waken the dead for their final judgement and oversee 'the weighing of the heart'. This was the method of judgement used to decide if a soul was worthy to enter the underworld. He was also the god who invented mummification. After Seth had killed Osiris, Anubis wrapped his body in linen to prevent it from decaying. 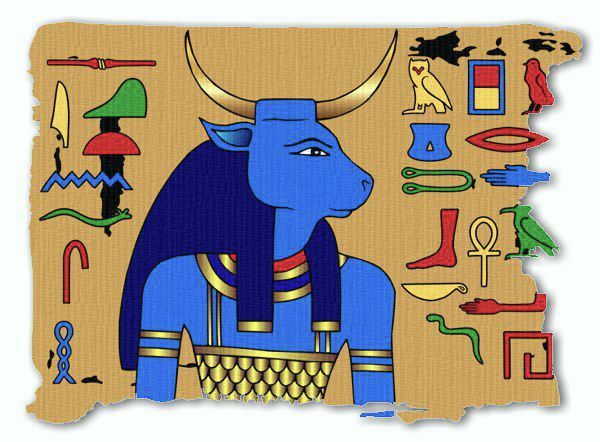 Apis was depicted as a bull. Apis was the Egyptian god of strength and fertility. The spirit of Apis was said to be present in the body of a real bull which was kept by the Pharaoh and looked after by his priests. At the end of the old year, the Apis bull was slaughtered and its flesh eaten by the Pharaoh. It was believed that the Pharaoh would then inherit the great power of Apis. Each year the priests would search for a new Apis bull which would then live a life of luxury until the ritual was repeated. Bastet was depicted with the head of a cat or lion. Bastet (Bast) was an Egyptian goddess from Lower Egypt who was associated with joy, music and dancing. 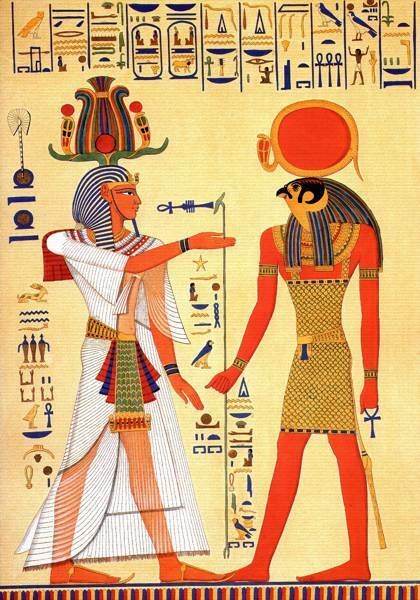 She was the mother of Mihos, another lion god, and the wife of Ptah, god of the arts and crafts. 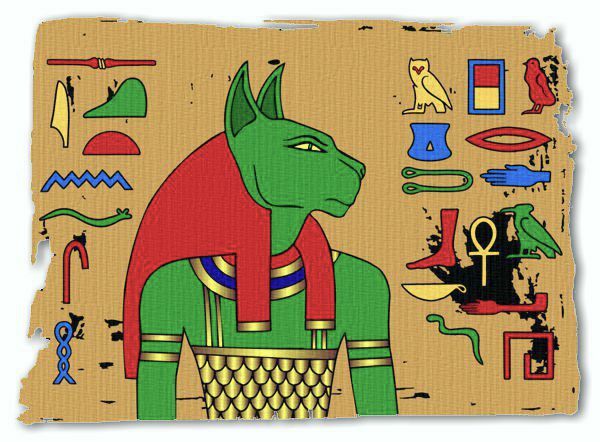 Bastet is mentioned in the Book of the Dead where she destroyed the bodies of the deceased with her 'royal flame' if they failed any of the tests for entry to the underworld. 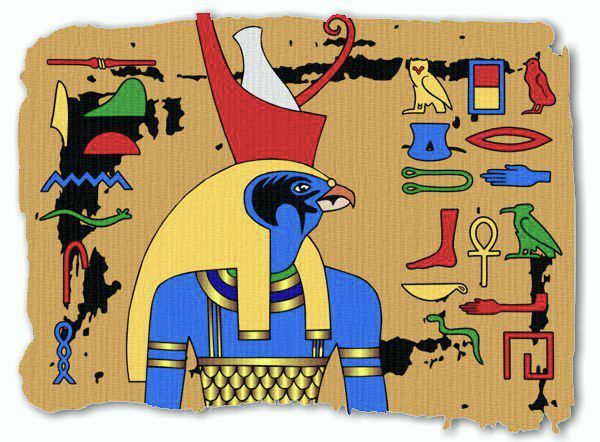 Horus was depicted as a falcon. Horus took the form of a falcon. He was the perfect symbol for the Egyptian god of the sky, light and goodness who soared above and protected the land of the Pharaohs. It was believed that each Pharaoh became Horus on Earth and was reborn as Horus after their death. In a battle which lasted 80 years, Horus conquered Seth, the god of Upper Egypt, to avenge the murder of his father, Osiris. 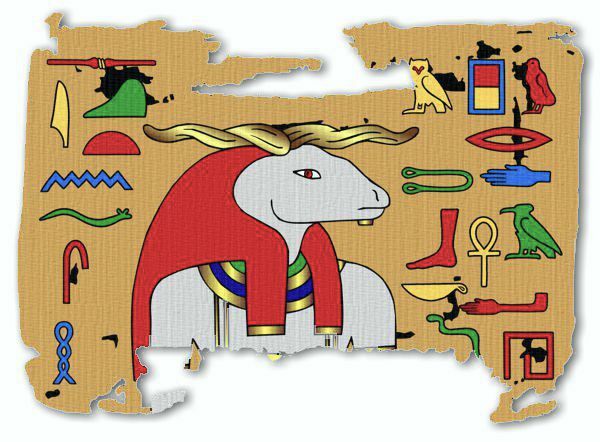 Khnum was depicted as a ram. Khnum was the Egyptian water god and the potter god of creation. It was believed that he created the first children on his potter's wheel with clay from the banks of the Nile. Khnum also protected the sun (in the form of the god Ra) on its daily journey through the underworld. Every night they sailed together in the solar barque until the sun safely rose again at the dawn of the new day. Seth was depicted as a strange composite creature. Seth was depicted as a strange creature that seems to be a composite of various animals like a giraffe, camel, ant eater or okapi. He was the Egyptian god of storms and chaos. Out of jealousy, Seth murdered his brother Osiris, the ruler of Egypt. He tricked Osiris into lying down inside an expensive chest, with the promise that it would be his, if he could fit inside it. With Osiris in position, Seth's collaborators nailed the lid shut and threw him into the Nile to drown. Isis, the devoted wife of Osiris, searched for and found the chest which held Osiris' body. Seth was so furious when she discovered his brother's body that he cut it into fourteen pieces and scattered them throughout the land. 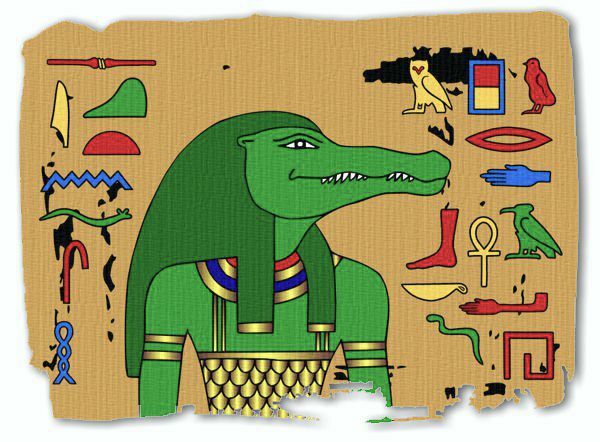 Sobek was depicted as a crocodile. 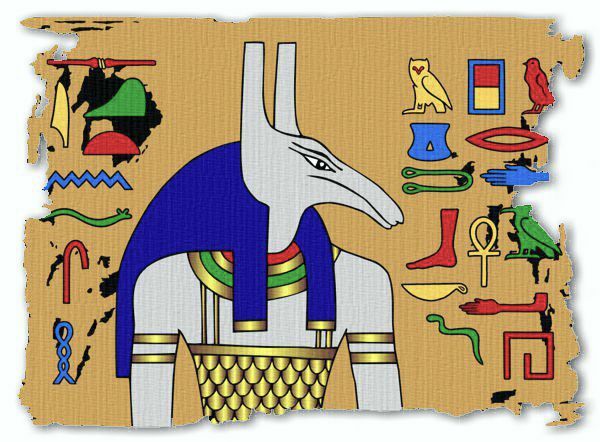 Sobek was the Egyptian god of the Nile which was believed to have been created from his sweat. As Sobek possessed the strength and nature of a crocodile, which the Egyptians both feared and respected, he became a symbol of the Pharaoh's power. The Nile, which was full of crocodiles, was important to the livelihood of the Egyptians. It therefore made good sense to have a god like Sobek who could appease these ferocious beasts. 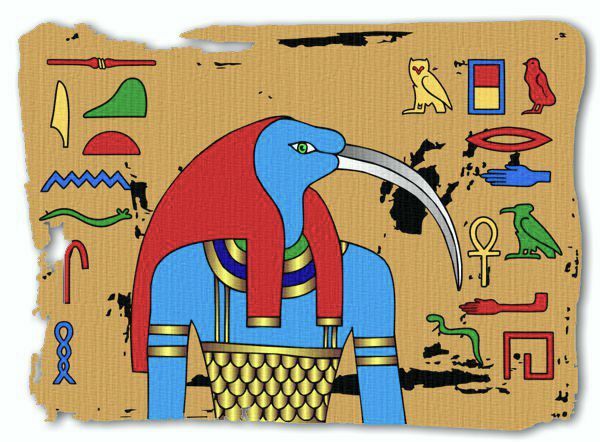 Thoth was depicted as an ibis. Thoth was the Egyptian god of wisdom, writing, numbers, the arts, astronomy and magic. He was also a god of the underworld, in charge of the scales in the Hall of Judgement. Thoth used the scales to weigh the heart of the deceased against the feather of truth to determine if they were worthy to enter the afterlife. As the scribe of the gods, Thoth recorded the result of each judgement. Horus with a pharaoh wearing Hemhem crown.